It has been almost four years since Don't Ask, Don't Tell was replaced with a more lax policy on homosexuality in the military. Although an important step in the right direction, DADT's repeal didn't necessarily make things easier for all gay service members — especially veterans. To get the retroactive equality they deserve, gay veterans are asking for "honorable" discharges — and they have good reasons for asking, even years after they left the service. Prior to 2011, when DADT was finally repealed, gay service members were separated from the military, designated as "undesirable" to the service. Undesirable discharges apply to individuals who are deemed unfit for service, usually for some sort of injury or condition. Undesirable discharges are not considered dishonorable discharges, but they also aren't considered honorable — and that can have a major impact on the types of benefits that vets are eligible for. 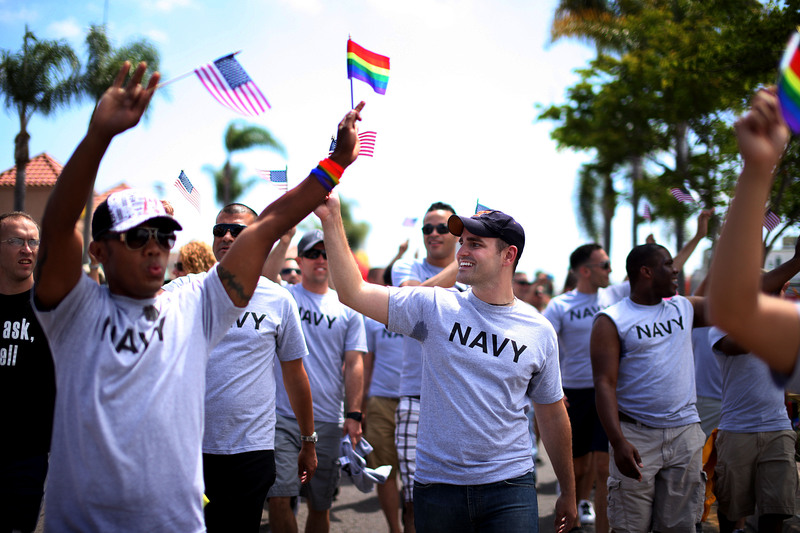 The New York Times claims that as many as 100,000 veterans were discharged for being gay between World War II and 2011. Now, dozens of them have petitioned the Department of Defense, asking for the government to change their discharges from undesirable to honorable. In some cases, they want the benefits that honorable dischargees are entitled to. In other cases, they want the honor that comes with being a valued veteran who served their country bravely. Because of their undesirable discharges, gay veterans don't qualify for the same benefits as other veterans. The Department of Veterans Affairs uses a veteran's discharge type to determine what benefits he or she qualifies for, including medical benefits, education benefits, and compensation benefits. According to the VA, an undesirable discharge can be considered to have been given "under dishonorable conditions," and can prevent an individual from receiving full benefits. This can mean that they don't receive the benefits that other veterans do, simply because they served as gay individuals before 2011. Fortunately, the federal government is working to get these veterans the honor and benefits they deserve. Since 2011, nearly 500 vets have submitted requests to have their discharge statuses upgraded, and according to the Times, about 80 percent of these requests have been granted. It's not likely, however, that a sweeping, across-the-board upgrade will come to those with the "undesirable" status. The process has some faults: Vets have to track down their discharge records to submit their applications for honorable status. If someone was discharged in WWII, there's a good chance that they don't have those readily at hand (or in digital form). To most of us, the Don't Ask, Don't Tell fight seems like a thing of the past. For some veterans, though, it's still causing problems, costing them benefits and honor in a big way.